This apple spray works great for fall, Christmas, crafts and floral projects. Approx 18'' tall sold each. 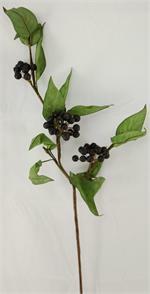 This spray is approx 16'' tall featuring green leaves with black berries on a brown wrapped stem. This corn cob pik looks good enough to eat. 12 per package. Approx 6'' tall. This fall harvest pik looks excellent use it in you floral or craft projects. 12 per bag. This fall nut pik is the perfect way to adorn you fall decorations. This fall nut pik is sure to make you floral or craft creations really shine 12 per bag. These pumpkin piks are just in time for fall add to any floral or craft project. 6 Per bag approx 2.5'' diameter.